The crime reports for January are below. We had a little jump in crime this month, just like we did last year in January 2012. This seems mostly due to a string of car break-ins and a few extra home burglaries. Both are detailed below. 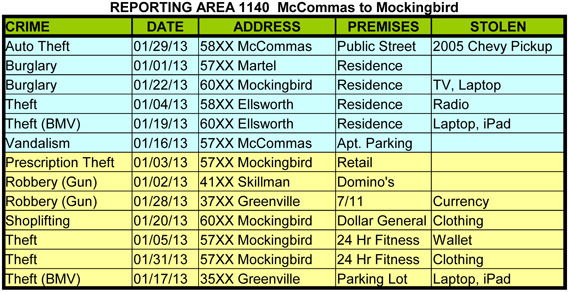 We also saw two robberies this month, both were “stick-ups” at local businesses (Dominos and 7/11). Police believe it may be the same suspect. There was a string of car breakins in the area south of Belmont beleived to be the work of a duo. They were witnessed breaking into a vehicle on Oram. Police were able to arrest a pair of suspects a few blocks away. They were covered in blood and glass cuts and carrying the stolen goodies from the vehicle on Oram. (Police also found heroin paraphenalia on them.) Unfortunately, the victim declined to prosecute, so these guys are back on the street again. Police have their mugshots handy and will be on the look out for us. The suspects were described as two latin males in a red Ford Pickup. This pair was also witnessed by another resident. In both cases, one stayed in the vehicle while the other broke out a window to get access to the inside of the car. If you see someone acting in the manner, please call 911 right away and get a license plate if possible. We’ve been doing much better on home burglaries over the last year. There were 7 this month in the area between Mockingbird and Llano, the north part of the neighborhood. Of these 7, 1 was a known suspect and another was a garage burglary. The remaining five all involved a forced entry from the rear with a theft of TV, laptops and jewelry. Its possible these could be connected. Not too long ago, I’d have been celebrating anything less than 10, but this is much higher than we’ve seen over the last year, so its possible we have a repeat offender in the area. Please take the usual precautions, light up the backyard at night and make sure that windows and doors are securely locked. March is upon us, and we all know what that means…. Two weekends in a row with parking problems and street closures. March 16th is the annual St. Pat’s event. I will be sending out an additional warning prior to the event, but in the meantime look for detailed info in the LGNA newsletter or the St. Pats Event Info on this site. The following weekend, the Rock ‘n Roll Dallas Half Marathon will be coming through the neighborhood. It will cross Central at McCommas, zig zag up to Greenville, up to Mockingbird and then come down Skillman to Swiss. There will be road closures in the area from 7am to 11:30am. There should be a more detailed info sheet hanging on your doorknob.